(Bloomberg) -- Three months into Brazilian President Jair Bolsonaro’s term, voters, investors and some supporters are starting to doubt if he can deliver on pledges to kick-start the economy and crack down on crime. At times, his government even looks like it could fall apart. The 64-year-old former Army captain has plummeted in opinion polls and antagonized key allies, while his cabinet is plagued by intrigue and infighting. Meanwhile, support for a pension overhaul looks more uncertain than ever, raising the risk of further debt increases and sovereign credit rating downgrades. Bolsonaro’s press office did not respond to requests for comment on this story. In a sign of fading optimism, the real has dropped 5.5 percent in March, while the Ibovespa stock exchange is down nearly 8 percent from recent highs. According to a survey of 122 institutional investors published by XP Investimentos earlier this month, equities could fall by another 19 percent if the pension reform stalls. An opinion poll published last week showed a 16 percent drop in support for Bolsonaro’s style of government. Following years of recession, corruption scandals and political turmoil, the mere thought of economic reforms and the government faltering triggers panic among business leaders. "If we don’t get this pension bill approved, there will be no investment, Brazil will go bankrupt, unemployment will return," said Luciano Hang, owner of the Havan department store chain. "The people won’t be fooled by politics." 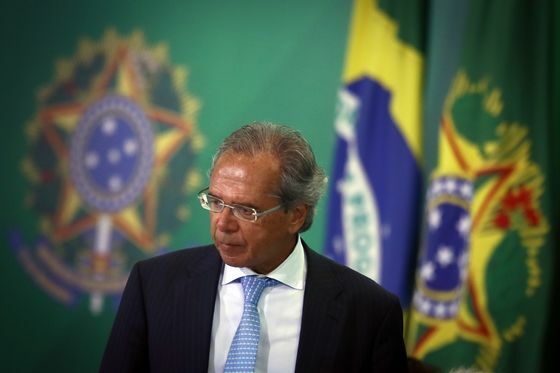 Much to the chagrin of investors who believe in Bolsonaro’s market-friendly Economy Minister Paulo Guedes, many of the government’s problems stem not from the opposition but from within its own ranks. Cabinet members openly vie for power; far-right ideologues clash with moderates and the president himself acts as if he were still campaigning, rallying his support base and riling the opposition with provocative tweets and videos. One source of friction are Bolsonaro’s sons, who propose policies, nominate staff, and publicly spar with cabinet members, despite having no official role in government. Carlos, who is the second of four sons and ran his father’s social media campaign, has placed several "confidants" inside the president’s press office to keep an eye on the media coverage. Their presence led the press secretary to resign this month, according to an official with direct knowledge of his decision. It was also a critical tweet from Carlos that irked Lower House President Rodrigo Maia, prompting him to tell TV Globo late last week that the president "needs to spend more time on the pension reform and less on Twitter." As things stand, the bill would not pass, Maia said. Some of Bolsonaro’s supporters say it’s a new way of doing politics, but critics argue it’s a lack of leadership, and that politicians of any stripe must still negotiate to get things done. "What Bolsonaro needs to do is step down from the campaign stump, he needs to show who is in charge, at home and in government," said Simone Tebet, head of the Senate’s Justice and Constitution Committee. To be sure, some investors are discounting the turbulence of the government’s first few months and remain optimistic that the president can deliver. Most believe that a pension bill will still be passed, albeit later and more watered down than previously expected. For the president’s support base, the case against him is largely a media fabrication. The press is a regular target of Bolsonaro’s ire. “Our president is suffering because of the media, but I still trust him," said Sibelli Marcolina, a lawyer from the southern state of Parana. 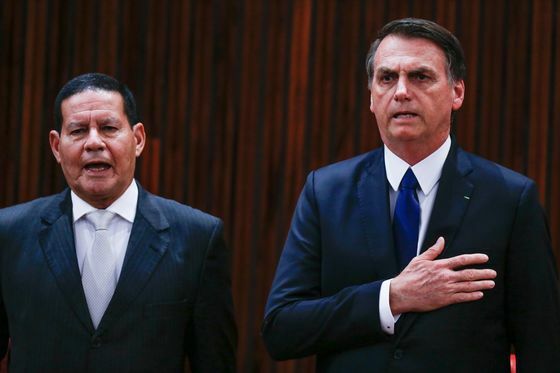 Since Carlos Bolsonaro and his Justice Minister Sergio Moro publicly clashed last week with Maia, administration officials have tried to calm tensions and reassure investors. Moro said the standoff had been overcome, and Vice President Hamilton Mourao has been calling for increased dialogue among cabinet members. "The key points are clarity in our objectives, determination to achieve them and patience to have the best dialogue," the retired Army General told Bloomberg News via text message. Yet it is not the first time the government has promised more cohesion and harmony. In fact, this Tuesday did little to convince skeptics. Investors were aghast when Guedes canceled a lower house hearing on the pension reform where he risked being grilled by the opposition. At the same time, Bolsonaro went on an unscheduled escapade with his wife to the movies. Upset congressional leaders then imposed one of the biggest defeats on any government by voting for new budget restrictions. On Wednesday, neither Guedes’s testimony in a Senate hearing, nor Bolsonaro’s pledge on Band TV to open dialogue with legislators did much to improve investor sentiment. The equity market tanked more 3.5 percent and the real lost more than two percent against the U.S. dollar. 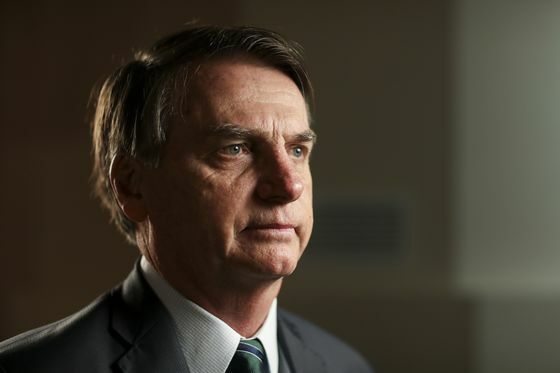 Editorials in all three of the country’s leading newspapers have blasted Bolsonaro for the recent political turmoil and questioned his ability to carry out his presidential duties. "What he’s shown so far is that we’ll have 3 years and 9 months of more turbulence," said Traumann, who advised former Finance Minister Henrique Meirelles.